I originally started to sketch an owl because I wanted to have a pattern to use for a little stuffed owl. After using some of my watercolor pencils I wanted to blend, but with out water so I tried my Pan Pastels. 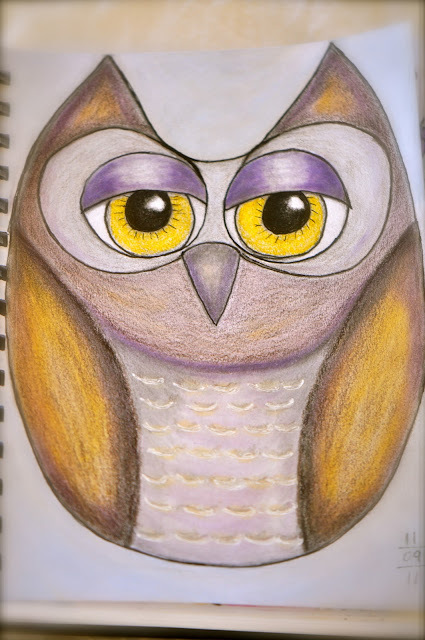 way the Pan Pastels blended my owl. Maybe I should have put some little feet on my hoot owl, what do you think? Thanks for dropping by to take a peek at my entry. Please drop by PPF to see all the other fun and beautiful art! what a cute hoot owl! yes, it would make a great stuffed owl! thanks for sharing! He is so cute - I love the colours you have used to create him. Did you ever did around to making the little stuffie? cute cute choooot I think! I LOVE HIM!!! I love all owls and this one or SO cute! Happy PPF. he is so cute! love that purple, he looks absolutely fantastic! love the music too. Gorgeous little owl! Love how you blended the pastels. I've never heard of pan pastels - I'm intrigued - they look great! I love this wee owl - his eyes are fabulous! So cute! I love this painting!! Owls are very 'in' this year. I see them in all of the stores on shirts, earring holders, dishware, wall art, stuffed animals... They are just da bomb right now! Yours is perfect!! Your little owl is really cute. I love the purple and gold together. I still call them "Hoot Owls". The other night I was walking my dog and there were two owls hooting back and forth at each other. It was one of those memorable walks...just a lovely evening with the moon bright and the weather cool and clean. Aaaah. I love your "Hoot Owl", and don't you like Pan Pastels? When we were in Death Valley I heard "Hoot Owls" for the first time, two of them talking to each other, it was magical. Becca, you are a incredible artist, and I love your work. And you know what else draws me in so much, the shots of the art supplies, and your materials that you take. They are so eyecatching, and colorful, I just love them. Hi Becca. Your Hoot Owl is just great and to me it would make a great wooden clock for the kitchen. I love it! give it to me. tee hee. Just joshing. What are pan pastels? I will have to go look it up but they look great. Wonderful job, enjoy your weekend and Happy PPF! Cute! You do it so well. Have a great weekend, enjoy. Your owl is cute with or without feet. Love the colors. Just adorable, I am a sucker for owls. I like the way the pan pastels look. Wonder if I should invest in a set? The pan pastels look so fun! Love your complementary color scheme of yellows and violets! I love owls, he's wonderful. HooOOOooo! teehee! Sweet One and I'm so interested to hear what you think about the pan pastels! Happy PPF Becca! Hoot Hoot! the big eyes and the color combination is really cool! Happy PPF and come share something sweet with us on my blog tomorrow for Sweet Saturdays!!! Your owl is fabulous!! I love the colours you chose and those pan pastels look very cool. I think feet and sitting on a branch would be a very nice addition to finish him off. You drew a beautiful owl! Great job dear! Such a cute owl - I love to work with pan pastels as well, their colors are so vibrant. This is my first time on your blog and while I'm writing this I'm listening to the beautiful music from your playlist and saw the fantastic video on Badlands National Park - brought back wonderful memories. Your photography is marvelous!! Owlsome work...love your big, bright-eyed friend! love the earthly sunrise tones of this owl!! I've heard of pan pastels and don't really understand how you use them. Now that I've seen the luminescent colors you used I'm totally intrigued. Such a cute owl! I am so hooked on owls right now. Love them! I really love the purple too! Such a cute owl my friend. Love those eyes..
How beautiful, Becca! I love the colours and those eyes are so fascinating! You are an excellent artist! Have a wonderful Sunday! Owls are my favorite bird. And this one is adorable!! Oh, she's lovely. I love the contour lines and the way you've drawn her eyes. That blending of color is beautiful--those pastels you show look like fun! I've never seen them before. p.s. I'm really enjoying the music you have playing on your blog. I love this owl. Wonderful! I think little feet would look good. Actually, talons on the owl; feet on the hoot owl. Every time I drop by I am enchanted and inspired. I adore the sound of rain and the rain chains today. And, being introduced to the most whimsical Zetti Syle art. I am going to put that in my play "basket." Peace.